New magnesium core ensures a firm and rigid build, without adding extra weight. Multiple flight modes to suite all users from beginners to pro’s. 28 minutes of flight time – a 25% increase from the Phantom 3 Professional. Push and Twist prop mounts are simple to secure and release. Obstacle Avoidance – DJI Phantom 4 reacts to and avoids obstacles in its path. TapFly mode – Tap anywhere on your live view display and the Phantom 4 will fly in that direction. ActiveTrack – No GPS bracelet, tracker or beacon required, the Phantom 4 will track your subject and follow them instinctively. Shoots 4K footage at 30fps and 1080p at 120fps. New and improved lens drastically increases sharpness. Advanced 3-axis gimbal reduces vibration and movement in-flight. The DJI Phantom 4 automatically keeps flight logs. New pilots are restricted to go beyond their abilities with the new beginner mode. Customisable controls to suite your specific flying style. DJI, the world’s leading maker of unmanned aerial vehicles, on Tuesday launched the Phantom 4, the first consumer quadcopter camera (or “drone”) to use highly advanced computer vision and sensing technology to make professional aerial imaging easier for everyone. The Phantom 4 expands on previous generations of DJI’s iconic Phantom line by adding new on-board intelligence that make piloting and shooting great shots simple through features like its Obstacle Sensing System, ActiveTrack and TapFly functionality. The Phantom 4’s Obstacle Sensing System features two forward-facing optical sensors that scan for obstacles and automatically direct the aircraft around the impediment when possible, reducing risk of collision, while ensuring flight direction remains constant. If the system determines the craft cannot go around the obstacle, it will slow to a stop and hover until the user redirects it. Obstacle avoidance also engages if the user triggers the drone’s “Return to Home” function to reduce the risk of collision when automatically flying back to its take off point. 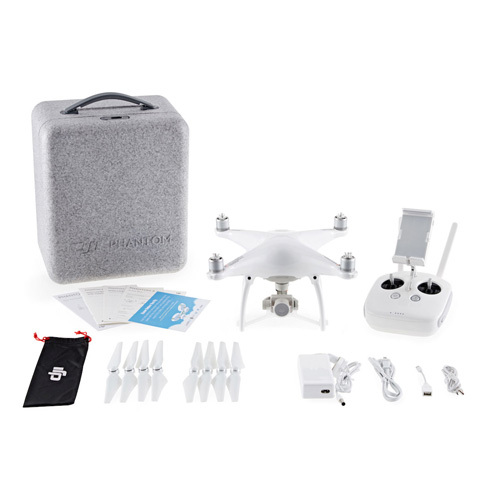 With ActiveTrack, the Phantom 4 breaks new ground, allowing users running the DJI Go app on iOS and Android devices to follow and keep the camera centered on the subject as it moves simply by tapping the subject on their smartphone or tablet. Perfectly-framed shots of moving joggers or cyclists, for example, simply require activating the ActiveTrack mode in the app. The Phantom 4 understands three-dimensional images and uses machine learning to keep the object in the shot, even when the subject changes its shape or turns while moving. Users have full control over camera movement while in ActiveTrack mode – and can even move the camera around the object while it is in motion as the Phantom 4 keeps the subject framed in the center of the shot autonomously. A “pause” button on the Phantom 4’s remote controller allows the user to halt an autonomous flight at any time, leaving the drone to hover. By using the TapFly function in the DJI Go app, users can double-tap a destination for their Phantom 4 on the screen, and the Phantom 4 calculates an optimal flight route to reach the destination, while avoiding any obstructions in its path. Tap another spot and the Phantom 4 will smoothly transition towards that destination making even the beginner pilot look like a seasoned professional. The Phantom 4’s camera, still the world’s best aerial-optimized 4K imaging device, has undergone an upgrade that includes improved optics for better corner sharpness and reduced chromatic aberration. The Phantom 4 also has DJI’s signature Lightbridge video transmission system onboard, allowing users to see what their camera sees in HD and in real-time on their smart devices at a distance up to five kilometers (3.1 miles). The Phantom 4’s form factor, still the classic quadcopter style pioneered by DJI, has been redesigned and redefined to emphasize elegance and smoother, more-aerodynamic lines. Its frame incorporates a lightweight composite core to provide enhanced stability and more-agile flight. The core now features a redesigned gimbal that provides more stability and vibration dampening, and has been repositioned for a better center of gravity and to reduce the risk of propellers getting in the shot. Refinements to motor efficiency, power management and a new intelligent battery have extended the Phantom 4’s flight time to 28 minutes, which means more time in the air to capture professional photos and video. DJI crafted the Phantom 4 with reliability in mind, including redundant inertial measurement units (IMUs) and dual compasses onboard. It uses new push-and-lock propellers that are faster to install and more secure in flight. 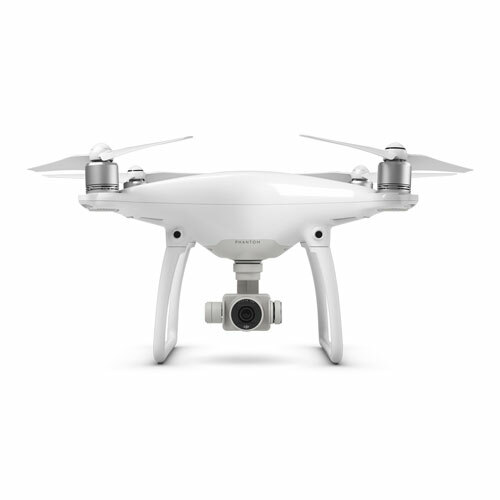 In addition to intelligence and ease-of-use, the Phantom 4 is built for fun. Its new “Sport Mode” for advanced flyers gives a taste of what drone racing feels like. In “Sport Mode,” the Phantom 4 can fly 20 meters per second (45 miles per hour) and ascends and descends more rapidly than in other modes. The craft’s acceleration and top speed in “Sport Mode” also mean it can reach locations for shots faster and capture shots you couldn’t get before. “Though the Phantom 4 is easy to use, let’s not forget it is a high-performance aircraft powered by unparalleled DJI technology,” said Senior Product Manager Paul Pan.